Of those who died over the past three years, 104 died due to causes like heart attack, alcohol intoxication and diseases, 29 committed suicide, and 51 were killed in accidents. 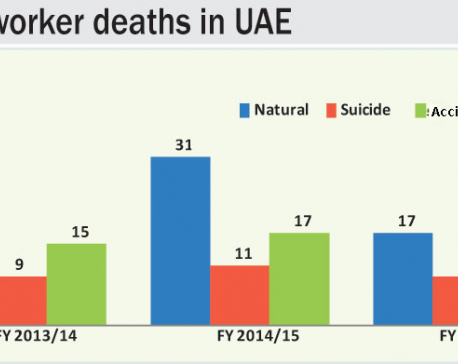 ABU DHABI (UAE) JULY 4: As many as five Nepali migrant workers on average have been dying every month over the last three years in the UAE, according to the figures maintained by Embassy of Nepal at Abu Dhabi. The age range of the dead workers is between 20 and 49 years, according to the embassy official. "The average age of the deceased is 32 years." A total of 184 Nepali migrant workers died since the fiscal year 2013/14, according to records of the embassy. It has further advised the migrant workers to undergo medical checkups at reliable medical centers in Nepal before heading for the UAE. Migrant workers should strictly follow the traffic signals and defined lanes while crossing the road and give priority to personal safety measures while working at risk-prone zones," Krishna Aryal, second secretary at Embassy of Nepal, said. Aryal also informed that a total of 100 Nepali migrant workers have been serving jail terms in various jails in the UAE. The major charges against Nepali migrant workers include murder, alcohol consumption, adultery, smoking, disturbing law and order, drugs abuse, drunk driving, visa overstay and forging documents, according to him.